One of the leading, prestigious events in the global Travel Trade calendar. The QTA stand showcased a strong delegation of leading private sector partners including hotels, destination management companies (DMCs) and other hospitality suppliers, providing a comprehensive one-stop welcoming service to the international travel trade. ‘Qatar Welcomes the World’ is a result of the recent visa announcements that Qatar is to become the most open country in the region. Sherbet Media’s prestigious First Class QTA branded taxis hugely complemented whole stand and brand’s presence at the event. QTA’s presence at WTM comes at a significant time in the country’s tourism development. To showcase this development, QTA’s branded taxis creative have distinguished itself form others by most eye-catching and ‘FLAGTASTIC’ full livery so far. 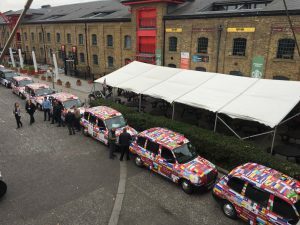 Mix of 80 colorful flags of visa-free countries have been chosen for display on Sherbet London taxis. 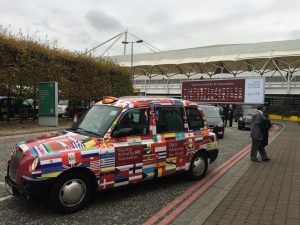 In addition, exclusive VIP pick up service was provided for ‘Visit Qatar‘ guests who went to WTM making it a smooth and enjoyable process to get to and from the location. Guests had a personal concierge service with carefully selected drivers who have been working with Visit Qatar for many years. Qatar taxis including utilizing our HD Digital Screen inside the vehicle featured branded tip seats with 6 different creatives, branded receipts and free Sherbet London WiFi available to use throughout all the journey. Also, each Qatar taxi was provided with Sherbet London goodie bags which was filled up to the top with refreshments, snacks and stationary. Overall event and our collaboration with ‘Visit Qatar’ turned out to be a huge success. Therefore, the campaign marked Qatar as one of the most recognizable brands at the World Travel Market London 2017. We are looking forward to future successful collaborations with ‘Visit Qatar’. PreviousPrevious post:Italia And Sherbet Media Taxis Promote Italian TourismNextNext post:Mansion Casino | We’re ready to play, are you?